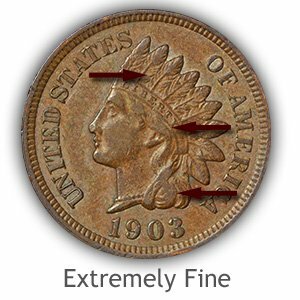 Judge condition yourself by following the How to Video - Grading Indian Head Pennies. 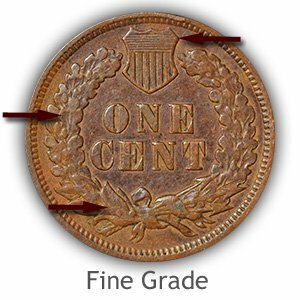 Grading condition is a necessary step; both collectors and dealers take, to accurately place a value on Indian head pennies. Value is often ruled by the eye appeal of the coin leading to its desirability. 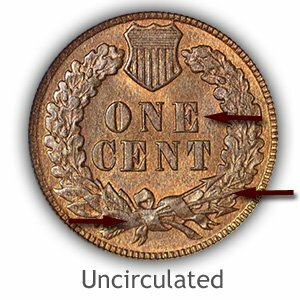 A heavily worn Indian cent is worth 75 cents to $1 each; however, above average condition pieces are valued at multiples of this price. 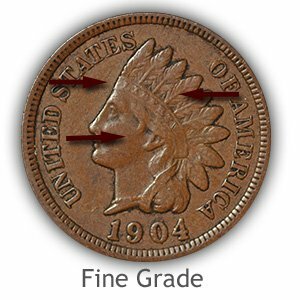 These subtle points to grading Indian head pennies are covered in detail below. 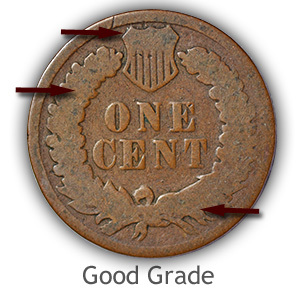 Grading Indian cents is a process of comparison, judging the condition of your penny and assigning a "grade." 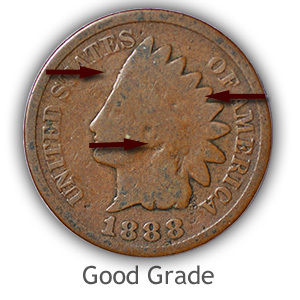 Assessing the amount of wear - if any - to the surface of the coin determines each grading category. 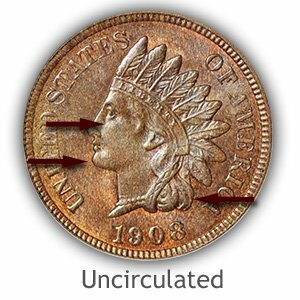 To confirm your Indian penny is uncirculated (no wear to the surface) slowly rotate it under a single light source. Luster radiates in bands and remains complete from rim to rim. Watch closely as the light moves over her cheek, any wear causes a change in texture and subtle changes in reflection. Full luster must remain in the following high points of the design. Light wear is often seen as smoothness on the metal. 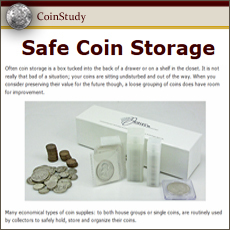 On copper coins this may even brighten the surface. Here is a coin that entered circulation, saw light use; and is beginning to display a small amount of wear. Although worn most of the finer detail is visible and the coin grades Extremely Fine. First to notice is the bright copper luster is gone, replaced by an even light brown color. Defining this grade, light wear is found only on the very highest points. Overall, a nice well detailed, sharp looking coin. 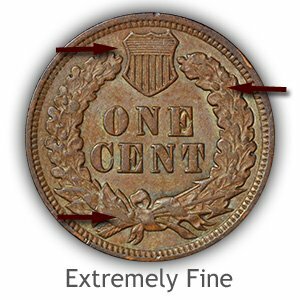 As an Indian penny begins to show moderate wear its condition is graded "Fine." Many dates are highly valued and desirable in this condition, especially the earlier years, pre 1880. It is not uncommon to see these offered at $15 and higher depending on date. Look first at the headband; if all letters to Liberty are readable your coin is a strong candidate for the fine grade and value. Worn to a shallow relief with little detail remaining describes an old Indian penny in "good" condition. Still an important coin because of its history, collectors today place a high value on the scarce dates, notably those minted in 1877 and those of the earlier Civil War years. Notice despite lack of fine details, complete outlines of portrait, date and lettering is intact. 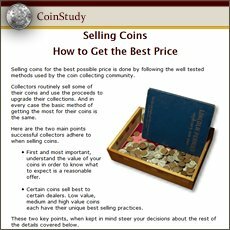 Grade your Indian pennies conservatively to realize a fair value. Coin grading is subjective, follow the points outlined above and in the video, quickly many of the subtle differences in condition become easier to recognize. One of the stars of the coin collecting hobby, Indian head pennies with their bold distinctive design is a very popular coin. Many collectors are building collections and putting a heavy demand on the rare dates and better condition coins. Discover the value of your Indian penny.